Workforce Solutions Cameron understands that it may be difficult for employers to stay informed on current laws. Therefore we have compiled the following resources to assist employers. Companies in all sectors of the American economy are facing complex workforce challenges in increasingly competitive domestic and global markets. Registered Apprenticeship is your proven solution for recruiting, training, and retaining world-class talent. View video below to learn how this program can benefit your business. 1,000 or fewer employees to manage their unemployment tax account online. Click Here to learn more about Unemployment Tax Services. State and federal laws require employers to display several posters at the workplace. Posters should be displayed in such a way that each employee can readily see them. Click to begin your quick & free, online service to register for your tax account as easily as possible. Texas Workforce Commission is partnering with the Texas Governor’s Committee on People With Disabilities and the Texas Workforce Solutions network for a campaign called Texas HireAbility to raise awareness about the benefits of hiring people with disabilities and to highlight the contributions of people with disabilities in the workforce. Click Here for more information about Texas HireAbility. This online version of Especially for Texas Employers is designed to be as easy as possible to use. It is like an electronic book. The book follows the format of the printed version as closely as possible, but can be a lot easier to get around in the online version than in the book, due to the many ways a user can navigate from topic to topic. Note: the book is organized by articles and topics. To scroll up or down, either use the up and down arrows on the scrollbar to the right of the text window, or else (and this is easier than using the mouse) click once in the text window and use the Page Down or Page Up keys to go down or up on the page. 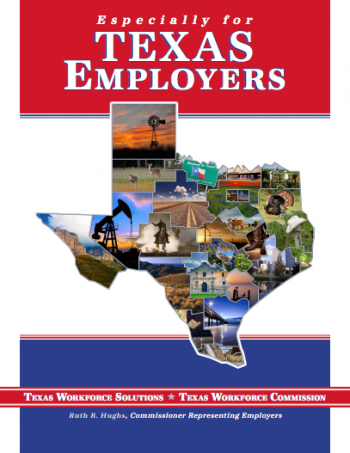 Click Here to view and download the "Especially for Texas Employers" handbook. Staff with Texas Workforce Solutions Vocational Rehabilitation Services work with you to understand your business needs and provide customized services. We help your employees become more aware of key disability issues, help you fill open positions at your business with qualified job seekers with disabilities, asses your workplace, job descriptions and recruitment and application processes to remove barriers, and provide training and accommodations assistance. There is no fee for our services. 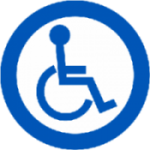 Click Here to learn more about Disability Employer Resources. Small businesses can apply to TWC for training offered by their local community or technical college, or the Texas Engineering Extension Service (TEEX). TWC processes the applications and works with the college to fund the specific courses selected by businesses for their employees. The Department of Labor (DOL) administers and enforces more than 180 federal laws. These mandates and the regulations that implement them cover many workplace activities for about 10 million employers and 125 million workers. This brief summary is intended to acquaint you with the major labor laws and not to offer a detailed exposition. Click her for more information of how the DOL can help your business. If you would like to utilize this service for your next hiring event, visit your nearest Workforce Solutions Cameron center, or click here to send us your information.